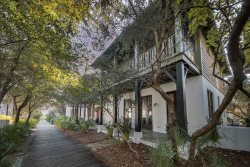 Beautiful 30A Townhouse on the Gulf of Mexico!!! Located off the iconic Scenic Highway 30A, nestled between Alys & Seagrove Beaches; Mermaid Cove is a hidden gem offering expansive Gulf Front Views. Close enough to hop on one of your complimentary bikes and ride to Rosemary’s most pristine shops & restaurants, but secluded enough to really get away from it all. This 2 bedroom, 2 ½ bathroom end unit townhouse provides adequate sleeping for five, and parking for two. Kick off the party on the back patio! With picturesque Gulf Views as your back drop, take advantage of the gas grill, & dining area; or the EFFORTLESS beach access just steps from your back door! A pool is also provided for your enjoyment, found at the East end on the community. Mermaid Cove’s recent renovations provides a stylish comfort sure to put your mind at ease. With an open concept main living space, you’ll be able to take in the views from every inch of this townhouse. The first floor provides a free-flowing kitchen, dining & living area; with stainless steel appliances in the kitchen, ample room for everyone at the large dining table, and brand new living furniture to lounge around in. Making your way to the second level sleeping quarters, where two bedrooms provide sleeping for up to five. The bunk room, on the North side of the townhouse, has a twin over full bunk, private balcony & en suite. ; laughs will be made by the kids while they snuggle up with their favorite movie. You’ll catch up on some well needed rest in the GULF FRONT master suite, furnished with a king size bed & en suite; or drink in the sunrise with a warm cup of coffee from the private master balcony. Kimi was responsive, thorough and very easy to work with. The location and beach access is unbeatable. The interior updates make it feel like a brand new townhouse. Kimi was the best! We were a little nervous not knowing much about the area and her follow up from the start of our booking, availability should we have needed it throughout our stay and her follow up note after our departure made us feel like valued guests and confident that we would have no worries with the stay. She is an asset to your organization. Very personable and efficient! Mermaid Cove is very special and we enjoyed our stay immensely. The exquisite views, beautiful touches in decor, hardwood floors were all lovely . We loved the views particularly from the spacious master balcony with the very comfortable lounge chairs in the early morning and at sunset. The patio was perfect for outdoor dining and listening to the breaking waves. A very special place. Loved the views, the newly remodeled decore, the easy walk out door to the beach steps, very few steps down to the beach, great deck off master with fabulous view. Wonderful. Looks like it's booked up til end of summer or I would return soon!